Bill Walton had a prominent career in the NBA where he was a league Most Valuable Player (MVP) and won two NBA championships. Walton was inducted into the Naismith Memorial Basketball Hall of Fame on May 10, 1993. 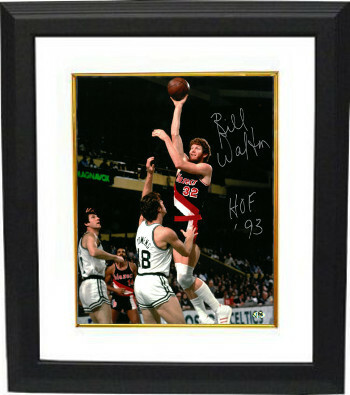 Bill Walton has hand signed this Portland Trail Blazers 8x10 Photo with HOF 93 inscription. MAB Hologram and Certificate of Authenticity from Athlon Sports. Custom White Mat and Premium Black Color Framed as shown.